I first began drinking, and enjoying, wine when I was living in Italy twenty years ago. I lived in Piemonte in the north of Italy. While I lived in a town considered the “rice capital” of Italy, I was living just a short drive from the famous wine towns of Barolo and Barbaresco. But, I did not know this at the time. What I did know is that the wine my friends would open for us to drink were tasty. And, in hindsight, we were drinking barbera and dolcetto, and on special occasions, nebbiolo. As I began learning more about wine over the years, I have always found myself drawn to the wines of Piemonte, especially nebbiolo. Nebbiolo is a noble grape. It has aromas of roses and red fruit, earthy flavors and great acidity and tannins. It is a wine that pairs with all types of foods. And Barolo and Barbaresco are the “king and queen” nebbiolos. These wines require some time in the cellar and can come with a hefty price tag. So what if you want to drink nebbiolo more often? Well you can! Barolo and Barbaresco are towns located in the Langhe, an area of rolling hills in the Piemonte region. Grapes are grown all over the hills and many of the vines do not fall within the town lines of Barolo and Barbaresco. And here is the secret – if you want to drink nebbiolo that is a bit more ready-to-drink and at an affordable price, then look for a nebbiolo from the Langhe region and not specifically from the famous towns. And this is what brings me to the Please The Palate “pick of the week” – Renato Ratti Langhe Nebbiolo 2014. Renato Ratti is a winery started by iconic visionary Renato Ratti and is today run by his son Pietro Ratti. Located in Barolo, they believe that “wines of remarkable character come from great vineyards.” With six vineyards covering 86 acres, each wine represents the place from which it comes. 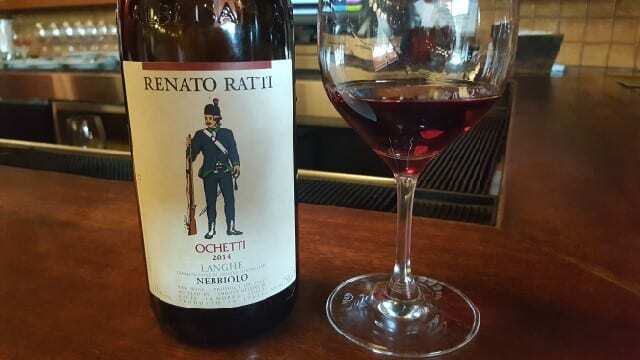 The Renato Ratti Langhe Nebbiolo comes from the Ochetti vineyards in the sandy hills above the Tanaro River. The wine is aged in oak barrels for one year. The wine is elegant and accessible with red fruit aromas of strawberry and raspberry as well as savory, earthy notes. The wine has bright acidity and soft tannins. While the wine will evolve over time, it is ready to drink now. And it costs $25 or less. So, if you want to drink nebbiolo tonight, find a bottle of Laghe nebbiolo, especially the Renatto Ratti Langhe Nebbiolo 2014, and enjoy! This entry was posted in Wine and tagged Italian Wine, Langhe, Langhe nebbiolo, Nebbiolo, pick of the week, Piemonte, Renato Ratti, Renato Ratti Langhe Nebbiolo 2014 by Allison Levine.